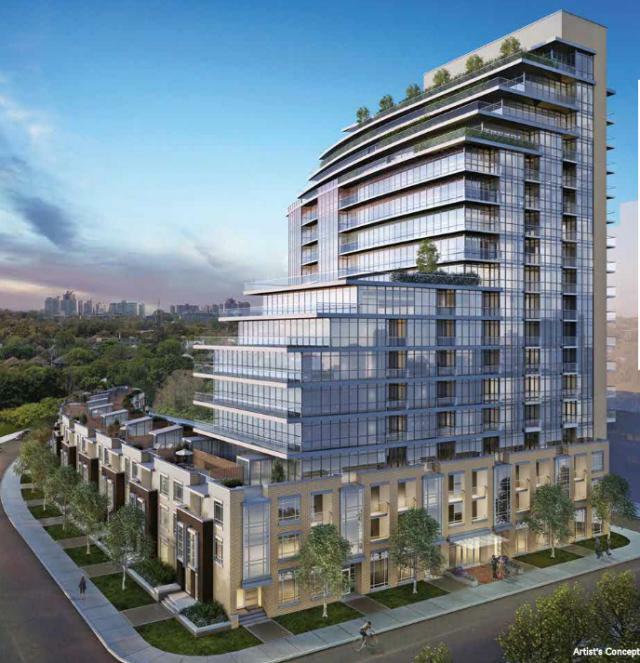 With the arrival of CityTowns at The Berwick, Midtown's most desirable neighbourhood welcomes one of the most sophisticated new residences in its history. Andrin Homes and The Brown Group of Companies, along with the award-winning architectural firm of Page + Steele, have designed 20 exquisite townhomes to perfectly complement the terraced design of the intimate 17-storey building, now under construction on Berwick Avenue. These homes, ranging in size from 1,830 to 2,170 square feet, feature convenient front door access to Duplex Avenue in addition to direct access from your private underground parking. Once home, contemporary, luxurious finishes abound. You'll love prepping food in your entertainment kitchen complete with granite counter tops, European-inspired premium cabinetry, mosaic back splash, sleek fixtures, and generous islands. Full-floor master retreats feature large dressing rooms and well-appointed baths with private water closets, free-standing soaker tubs, glazed showers and marble appointments throughout. To ensure enjoyment of this urban serenity just steps away from all Midtown has to offer, most town homes offer convenient ground floor patios, private mid-level balconies and large entertainment sky yards with up to 721 sq. ft. of total outdoor living space overlooking the tree-lined streets of Chaplin Estates.